At CAI, we strive to provide cellular assays for the most clinically relevant targets and mutants for Oncology, Inflammation, and other therapeutic areas. These assays are valuable for discovering and assessing the potency of new chemical entities or other drug-like molecules, and for probing the mechanism of action of known inhibitors. We are happy to provide compound screening in a human cell-based assay for ibrutinib and dasatinib resistant BTK mutants with our ClariCELL™ Kinase Assay Testing Service as well as our ClariCELL™ Kinase Assay Kits. 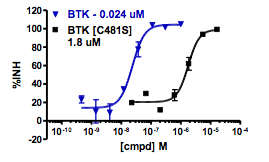 Click here to view IC50 curves for ibrutinib and dasatinib against all of the BTK and BTK mutant ClariCELL™ assays. Please visit this site frequently for updates, or contact us for more details!